This striking and modern day alternative to a tiara is a medley of the tropical meets the traditional in a truly tasteful fashion. 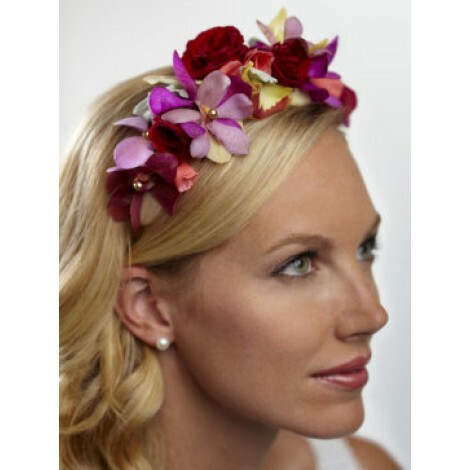 This adorable floral headband features; Gold cymbidium orchids, coral roses, red spray roses, lavender vanda orchids, red vanda orchids and dusty miller stems. 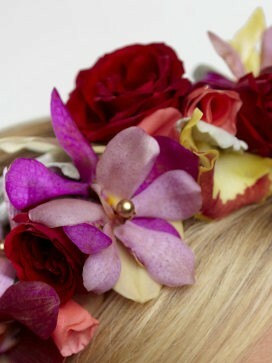 All expertly arranged and attached to a headband to create a striking look of natural beauty and charm. Approximate dimensions; 19 inches in length and 3 inches in diameter.